Trijit provides most reliable and most secured Microsoft exchange email hosting services for your business along with Exceptional Support which our customers named as "Legendary Support". Corporate-class business email, calendar, and contacts on your Desktop, Laptop, Mobile, and Tablet. Servers will be protected by anti-malware and anti-spam filters to make your emails more secure. 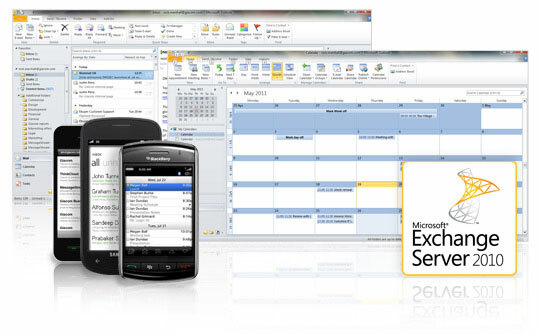 Trijit made the way easy now for the business email solutions for the corporate user by providing Microsoft Hosted Exchange 2010 Email Services. Single place for your data - Trijit delivers well-integrated user experience by giving users a place for archive. Patching is automatic - Trijit provides automatic patching which completely saves the service and maintenance effort and time of email system. Outlook with less integration - Where your email can be configured easily with outlook for offline email access. Get secure access from anywhere-anytime - We give space for users to access and use his/her email through any browsers and touchable devices (like smartphones and tablets). Microsoft Exchange Hosting 2010 delivered by Trijit comes with advanced reliability & security to protect your information and data through email. Preventing data loss - While informing the internal compliance policies, we can prevent sending important data through email to unauthorized person. Anti-spam & Antivirus maintenance - We regularly update the anti-spam and antivirus to protect the customers data with the latest malware and spam. Financially backed SLA - We deliver exchange hosting with reliable and secure backed with 99.999% uptime guarantee. Securing the data - Trijit provides hosted exchange services from its United States (US) datacenter and also from its India datacenter which is distributed data centers which also provides data backup and disaster recovery facilities to keep your important data safe. Trijit gives you the peace of mind to run your business successfully by providing well maintained and monitored Exchange 2010 servers for your email services. Next-level support - Trijit introduces Legendary Support (means single point of contact), which is 24/7 support through phone, email and live chat. Managing Organization - Trijit provides web based Exchange Administration Center which is easy-to-use.